Being a NICU mom is so draining. Bobby and I don't feel like parents yet because we're not the ones in charge of Kaygan. It feels more like we are visitors to some little baby that we love dearly, but isn't ours. It's getting better, Kaygan is now in an open crib and we've been able to change her diaper and help a little with her care. Her white cell count is now in a normal newborn range, so yay! She still has to have a full 7 days of antibiotics before she can be released, so we're looking at Wednesday for release probably! The biggest hurdle now is her eating. The tube that was in her mouth originally really screwed up her BFing attempts, so now we're trying to fix the damage... good news is that my milk came in today. So BFing will probably be less work with more satisfaction for her, and should continue to improve! We are rooming in at the hospital, though I was officially discharged last night. Went outside for the first time since Tuesday for lunch today! It was nice, but weird to be leaving without our baby! We were only gone for an hour, but still nice. Hour 1: Go to NICU, wake Kaygan and get get situated around cords and tubes, attempt to nurse, cuddle. Hour 2: Go back to room, pump both sides for 15-20 minutes, longer if it's still flowing good, take milk to NICU fridge, come back to room, wash pump, take the pump down to the microwave to sterilize, back to room. Hour 3: Rest, bump, eat, shower, visit, sleep etc. get ready to go back to NICU to start all over again! I have to do this through the night, so since we checking in on Tuesday evening, I've had roughly 15 hours of sleep. They still have NO idea what caused her infection. It could be GBS, but they don't think so...I didn't know that you could develop GBS after testing Neg for it at 35 weeks, but apparently you can. My dr. also stopped in yesterday morning and talked to us for a while. Turns out that the last 3 deliveries that he's used this type of vacuum on have all had the same thing happen. So, he is having the lot numbers pulled and is going to have them tested for contamination. The other 2 babies are fine now too! The other issues were most likely from being overdue. Here's a few pics from late Thursday night! So, things haven't changed much since I updated so late last night... early this morning? I can't remember when I typed out that info! Here's what I can think to tell you all that may be new! She's on normal oxygen now, and doing so well with it that they will probably take the nasal candulator (two prong nose thingy) out tonight or tomorrow morning. Her blood acid level is no longer a concern (from what we can tell). She nursed for 36 minutes on her first try!!!! 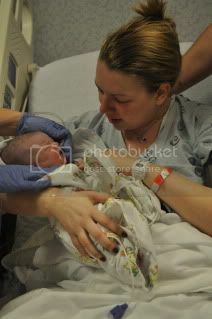 The LC (lactation consultant) and the NICU nurse were both absolutely amazed! She was alert and looking around the whole time! Neither the LC or her dr. can believe that I'm producing as much colostrum as I am... I've been able to pump up a pretty good stash for her already today! I won't be pumping as much now, just to empty out, because they want me to nurse her every 3 hours. She's been OK about maintaining her temperature, so she may get out of her 'spaceship' tomorrow and have an open 'regular' baby crib, but still in the NICU. She has 3 open sores on the back of her head and quite the bruise from the vacuum. I haven't actually seen the sores as they are bandaged, but they make me more nervous than anything else, tubes and all! Bobby and everyone else say that her bruise looks so much better than it originally had, but they all got to see her within an hour of her birth, and I had to wait about 6 hours. By the time I got to see her, she had a hat on and the bruise was covered... I did get to see her head in full 'conehead' form when they carried her to the warming pad just after she was born. I knew it was normal, so it didn't freak me out then... just now for some odd reason! They had to do a Lumbar Puncture this morning and get some spinal fluid to test to see if she has infection in her spinal fluid. Menengitis IS a possibility, but they aren't SUPER concerned that she has it. But, her white blood cell numbers are still very high, so something isn't right. She still has streaky lungs, which could be pneumonia, which would also explain her high white blood cells. We keep getting conflicting opinions on her energy and alertness. From the nurses, they actually have nicknamed her "Feisty". Dr. says she's not that alert or active. I'm choosing to listen a little more to the nurses, as they see her much more often than the dr.! Q: How long will she be in the NICU? A: As of right now, the time length that we've heard the most is roughly a week. This will depend mostly on the results of the Lumbar Puncture. Usually for NICU babies (who are usually preemies) the last 'hurdle' is eating... doesn't look like that will be an issue for Kaygan. They see her white count being her last hurdle, as long as she doesn't lose any weight once she goes off her feeding tube and just on breast milk. Q: How are you guys doing? A: We are both really tired! Of course that's to be expected from any new set of parents though! I personally am incredibly sore! Apparently, my body was not designed to deliver such a robust little (big?) baby! Won't be happening again! Next baby will be induced sooner if he/she looks to be anywhere near that big! Ok, so this may be repetitive, I'm just going to copy and paste from a few e-mails, so there may be some duplicate information. I'll try to edit... but I'm tired and we're waiting to hear from the NICU about some tests they are running... so, here it goes! 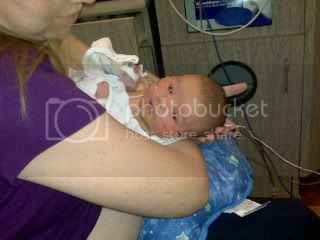 So, Kaygan Elizabeth was born Feb 17, 2010 at 4:45 pm. Weighed 9lbs and 9oz... BIG baby! 21.5 inches long! We had to have her vacuumed out... not the funnest thing, but I was numb from the waist down! There's also some not great news. 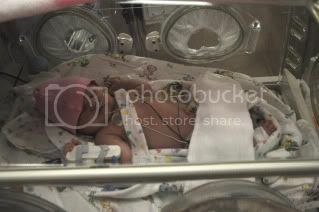 Kaygan is in in the NICU. 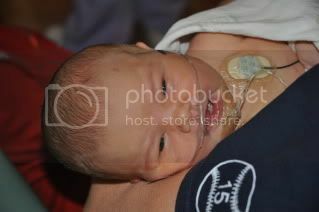 She wasn't breathing well at all when she was born, she really wasn't breathing much at all, just grunting alot. So, they worked on her in our room for about 10 minutes or so. Dr. Christian, a NICU Dr., just happened (not really, God put her in the right place at the right time) to be walking by our room on her way home when she saw a bunch of nurses come running into our room. 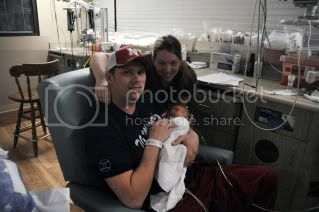 So, she came in, stayed with Kaygan for a few HOURS after she was done for the day to run some tests down in the NICU. Kaygan's oxygen levels were very low, even with a nasal tube supplying her oxygen. Her white blood cell count is very high, indicating infection, and her lungs are streaked and watery. She also had a -14 acid level in her blood... 0 is what they want to see. I got to hold her for about 30 seconds before they took her away, that was really really hard. Once they got her down to the NICU and started working on her, she got really mad, and started screaming... FINALLY breathing well. Her oxygen levels were still bad, but at least she was crying... she never did in my room. They did all the bloodwork and x-rays at that time as well. The Dr. came up and talked to us. Told us that she thought she'd pull through all of this, but would have alot of work ahead of her. She mentioned menengitis a few times, and a 2-4 week NICU stay. She came up a little while later and told me that her white cell count was so high, they were going to do a spinal to make sure that it wasn't menengitis or an infection that was getting into her spinal cord. 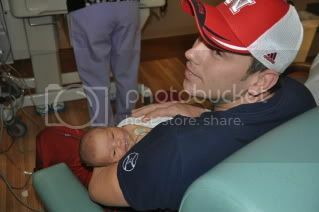 5 minutes later, Bobby came back from the NICU where he was visiting Kaygan. The Dr. gave him good news! Kaygan was looking so good color wise and breathing wise etc. 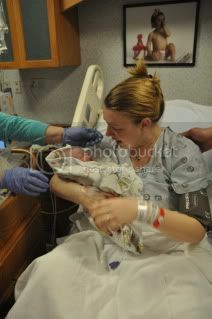 that she thought maybe everything was just due to the stress of the delivery and having the cord wrapped around her neck. Kaygan was also happily sucking away on a pacifier and sleeping on her belly. She has 3 open sores on the back of her head from the vacuum, so she was more comfortable on her belly. I Finally got to go down to see her around 10:30. I wasn't allowed out of bed till my epidural wore off, and it took that long! She has a good little grip and isn't very fussy. 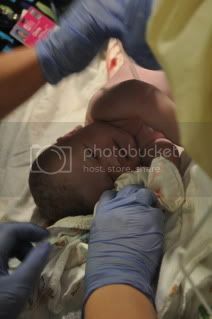 Even when they stuck her for some blood, she didn't cry, just squirmed and kicked a bit! They are testing her white blood cell count again at midnight and things will go from there. Her Acid level is now at -3 after they flushed her blood. So, that's a good thing, and they are going to start weening her off of the oxygen overnight or tomorrow since she's breathing so well on her own, and no more grunting! I could see them lift her up like this from my bed... this was when I really started to get nervous. Having to give her back... so hard. Well, my little girl is beautiful! I barely had time to take in her looks after I delivered, I just was too scared at that time! It was very surreal. It's just weird. So, over in the NICU, I got to put my hand in her little nest and hold her hand. She has a very good grip. She got fussy while we were down there, and as soon as I started talking to her, she stopped immediately. They also had to stick her foot and collect a bunch of blood. They do that by squeezing the puncture mark and 'scooping' it up with a vile. She really didn't like that, but she still never cried, just squirmed a bunch. She has streaking in her lungs. This could be pnemonia or an infection or just some amniotic fluid that she couldn't get out on her own. They are keeping an eye on it for now. After they got her down there, they had her on her back and she really started to scream. This obviously perked up her color alot. So much in fact, that they're going to continue oxygen, but ween her throughout the night. They are also holding off on her spinal until they do a blood test at midnight. While her white cell levels were very high when they tested them earlier and they thought it could be an infection, there's also a possibility that the levels are just so high because she had a very stressful birth. We're hoping for that scenario. She has a tube into her stomach. Right now she's getting sugar water, but I"m going to try to pump soon and they'll feed her whatever I can get, probably starting tomorrow. She had acid in her blood, but that's gone from -14 to -3, and they want it at 0, so she's almost there... the blood flushing worked! When they'd first gotten her down there, she was very upset and fiesty. They rolled her onto her belly and she fell right asleep. We had to have a vacuum delivery, and she has 3 open sores on the back of her head from that. They are guessing that they were really hurting her, and that's why she immediately calmed down when they put her on her belly. The reason all of this is happening: She was over due and that's how she got the fluid in her lungs. The cord was wrapped around her neck, which didn't remove the acid from her blood the way it's supposed to. Because she was over due, my placenta also came out in pieces... which is just really weird... but it had obviously started to die. There were a few other things that they mentioned, but basically, I should have induced sooner and we may not have had some of these issues, though there still might have been a few, they're just not sure. So, that's where things stand now. They'll do another blood draw on her at midnight to check her white cell count. If that's still too high, a spinal will be done. They may also put an IV into her cord stump and draw blood from there as needed, so they don't have to keep sticking her. Here's her little 'spaceship'. It's grainy, we didn't want to use flash and disturb her! 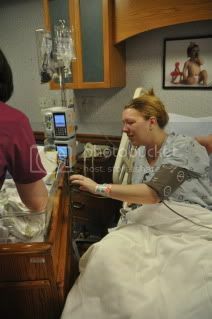 We know that Kayla and Becky put out about 500 txts within minutes of her birth and realizing there are problems. Thank you all for the prayers... they are obviously working. Keep praying for our little girl. She may still have a fight ahead of her, but all of the Dr.s and Nurses who've seen her are feeling much more positive about her status... she's apparently the talk of the floor too, as several random nurses have stopped in just to tell us how good they've heard she is doing. Oh, she's not the only talk of the floor... there was a baby born not long before her with a full tooth!!! They wheeled that baby by our crowd in the hall and they all got to see it! How crazy is that! How far along: 40 Weeks and 1 Day... my time was officially here yesterday! Total weight gain/loss: 24 lbs... I hope they don't weigh me again...I hate that stupid scale! Maternity clothes: Umm, some shirts still, but I've basically resorted to yoga or running pants and t-shirts or sweatshirts. Stretch marks: Yes, and I think some of them might actually rip open soon! Sleep: ***YAWN*** Sleep... what was that again? Best moment last week: Hitting my due date... which was also a not great moment, as nothing happened!!! Movement: Still a good mover, though it's mush less kicks and punches... she's out of room and just stretches now! Food cravings: A Dairy Queen Ice Cream Cake! My family is on orders to pick one up while Bobby and I are having our first 'family hours' with Kaygan. Labor Signs: None. No internal progress at the 40 week appt. Been having some major pain and contractions, but they seem to be doing no good! What I miss: being Comfortable! 'Fun' new symptom: My whole stomach has gone numb. The top part is constant pins and needles feeling, which HURTS. The only way to get it to go away is to lay down, so, I've been having to do that more often than I'd like! 1 Day Overdue: Eviction Notice Served! So, just got back from my appointment. Dr. checked me and had to dig around ...again. He made the comment "man, you are still so far up there"... at this point, I knew that all of my possible contractions over the past few days haven't been doing anything. He finishes checking me and says "well, I still can't even get a finger in there, and I was even a little mean to you and tried to!" So, he told me I can induce anytime I want, including tonight if I want. I don't want to, as much as I want her here, I don't want to jump the gun too quickly. Dr. said that with the way my body is 'misbehaving' right now, it only has about a 50% chance of being successful. He also said he really didn't want me to go past next Thursday since I'll be 41 weeks. I told him that I wanted to be induced on Tuesday night. That will be the best time for Bobby's parents to travel down and have their time off. So, he said we'll check in on Tuesday evening (and I should eat a nice big meal before hand) and we'll start cytotec. Pitocin will start on Wednesday, and after 24 hours (basically Wednesday evening) if I haven't had much progress, we have the option to stop for an hour or two, take a break and start again, for another 24 hours, OR have a c/s. So, that's the plan as of right now. Kaygan WILL be here on the 17th or 18th! Well, unless by some miracle she comes before then. Except, well, it doesn't seem to be THE day... Today is my Due Date though! Everything is ready for Kaygan! I made a sheet for her carriage bed. This is the carriage (think I've mentioned it before) that is over 100 years old. It was used by my Grandpa Theiss as well as his 3 brothers, and many many other babies over the past 100 years or so! 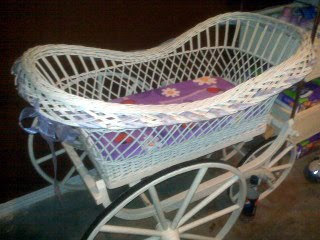 I love it and am so excited to use it for Kaygan! I did have to make my own sheet though. Yes, I've only made one so far, but she'll be sleeping on top of water proof pads, so hopefully that one sheet will do until I can make a few more! It was pretty easy though. 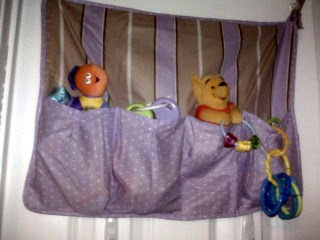 I used a really cute fabric that I found on e-bay. 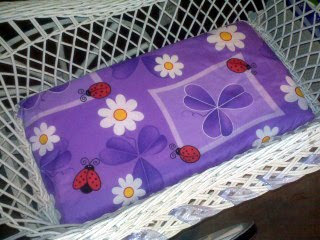 I was a little nervous about finding things that were purple with ladybugs, but I've actually been pretty successful! 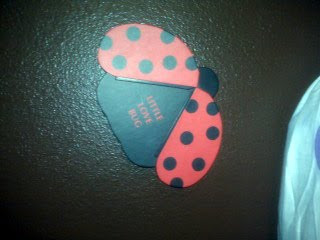 We were at Walmart last week, and this little ladybug was a candy box... so of course, we had to get it! Kaygan's toys are all ready for her! I have a dr. appointment tomorrow morning. Hopefully there is some progress, but if not (or maybe even if there is) I'm going to talk to him about inducing. I'm so ready for this little girl to be here! The past week has been very painful for me, and it's really starting to take it's toll on me! I've never been one to panic about things, but it seems that I'm having some panic/anxiety issues or something. Not due to impatience or fear of delivery, but due to the constant pain I'm currently in. I literally feel like I need to get out of my own body! This can't be good for Kaygan! So, while I really wanted to be able to just let this all happen naturally, I just don't know that I'll be able to do that! HOPEfully, there will be a little pit of progress naturally, but, as I don't feel safe going past 41 weeks (40weeks 5 days specifically... thanks Knelli!) I'm going to talk to my dr. about inducing next Tuesday night or Wednesday morning. I don't know if he'll let me do it then, but he's said that he wouldn't make me go past 41 weeks, and that will be next Thursday... so, here's hoping for a baby by next Wednesday at the latest! Bobby's parents are coming down... sounds like they are jumping in the car to make the trek from Seward, NE, as soon as we get checked in! It will be so fun to have them here for a few days! Kaygan will be the 5th Grandchild for them, though they already have 4 Great Grandkids as well! Kaygan will be the first Grandchild for my parents! Well, unless you count their Grand Pups! Madison and Oscar (Becky's poodle) will have to share the attention now... well, actually, they'll probably just have to give up the attention! 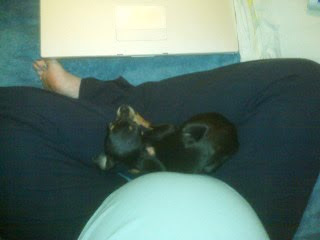 Madison is very ready for Kaygan to come, but only because she's tired of not fitting in Mommy's lap anymore! So, IF this little girl actually comes on the 11th, these will be her 'Stats'! This time next year your baby will be 51 Weeks Old! Your baby will start kindergarten in 2015, be old enough to drive a car in 2026, finish high school in 2028, and will graduate from college with the class of 2032, give or take a year. Can you imagine?